This one comes all the way from Sam in Nepal! 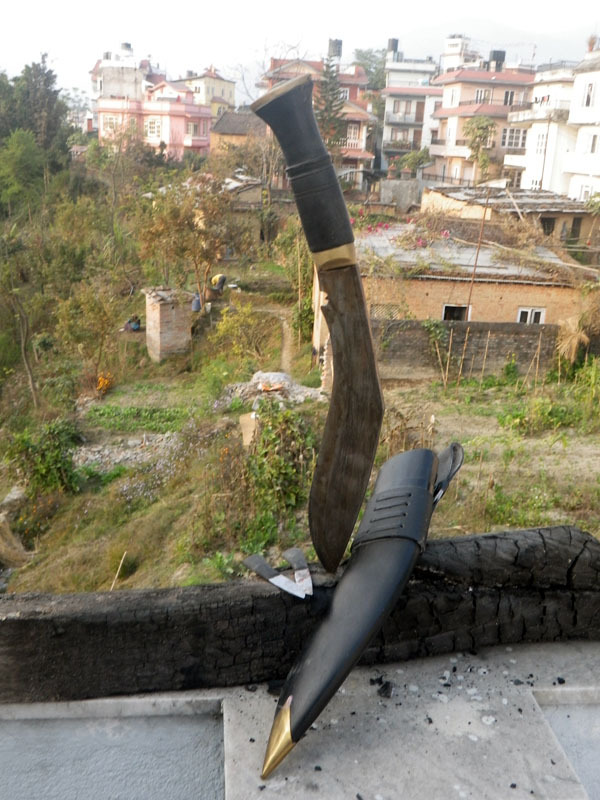 For hundreds of years the Gurkhas have carried Kukris, this one is a charcoal forged from high quality steel handcrafted from the mountains of Nepal by smiths who have been making Kukris for the Gurkhas for generations. The blade is 11" long and 1/2"thick of high quality steel which is unpolished to create as little light refection as possible. The notch in the blade is serves as a conduit for blood to drip out so the handle doesn't become slick with blood and slip while in use. The handle is 5 inches making the overall blade length a nice 16"
The handle is made of buffalo horn with brass worked into the hilt and bottom which gives it a nice grippy feel. 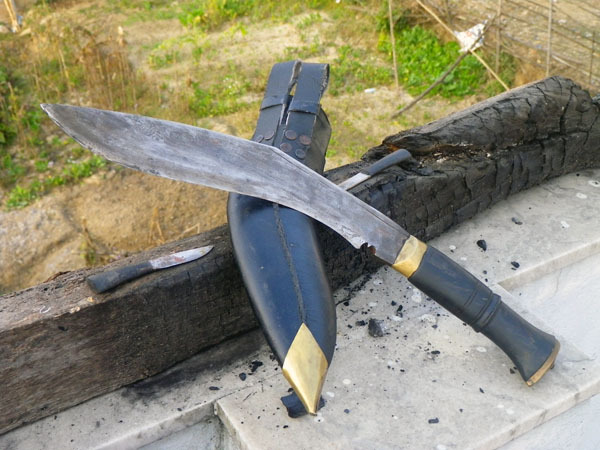 The scabbard is made from buffalo hide over flame hardened wood with brass worked into the tip so you don't cut through the scabbard when sheathing it. It has two belt loops made from buffalo hide so you can strap it easily to a belt or shoulder rig. The scabbard also has two pockets on the back one of which holds a steel called a "chakmak" for sharpening the blade or striking sparks for firestarting. The other pocket holds the "karda" for skinning small game. Total weight is just over 700 grams (Editor: about 25 ounces). Overall a very sturdy blade I seen it used to decapitate buffalo with a single strike. Holds a keen close to shaving edge and keeps it for quite a while through heavy use. Tough, versatile, and damn good looking I have used this blade to cut down small trees, start fires, and butcher an animal with ease. Definitely my first choice if i had to choose an all purpose survival knife.